Latin America's largest country once looked ascendant. 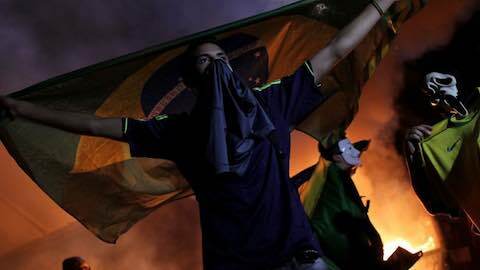 Now Brazil has been laid low by widespread violence, structural racism, endemic corruption, and external economic shocks. The staggering loss was all the more painful because it took place in Brazil, which was hosting the World Cup. Brazil's national football team hadn't lost at home in 62 matches going back to 1975. It was a very public humiliation that took place before heads of state and millions of people watching the televised match. Not only had the Brazilian economy grown at a rapid pace in the first decade of the 21st century -- averaging between 4 and 5 percent -- but it had dramatically reduced its inequality. The policies of President Lula da Silva, the charismatic leader and former trade unionist, had pulled 26 million Brazilians out of poverty. The Bolsa Familia -- the family allowance of direct cash payments to the poor -- helped to swell the middle class from 45 million to 105 million in just 10 years, a truly remarkable development in a country of 200 million people. The Brazilian model didn't just offer hope for other countries facing underdevelopment and economic inequality. Along with the other BRICS -- Russia, India, China, South Africa -- Brazil was leading the “rise of the rest” that would dethrone the United States and usher in a truly multipolar world. Lula, the left-winger turned powerbroker, epitomized this new post-post-Cold War world, negotiating deals with both George W. Bush and Hugo Chavez, Germany and China, the mandarins of the international financial system and the poorest inhabitants of the urban slums. He had turned a country best known for Carnival, samba, and beaches into a serious global competitor. Lula's successor, Dilma Rousseff, took over in 2011. Going into 2014, the Brazilian economy wasn't performing at quite the same levels as in the Lula years, but it was still registering modest growth. Rousseff had reasonably high approval ratings in her first term and polled a still-respectable 40 percent at the end of 2014. Critics have taken aim at the Rousseff administration for its corruption and mismanagement. Analysts blame the collapse of the commodities market and the slowdown in Chinese imports. Still others identify Brazil's persistent poverty and inequality as the culprits. Four Brazilian cities had a murder rate of over 100 per 100,000 residents. Between 5 percent and 8 percent of Brazilian homicides are solved -- as compared to 65 percent of U.S. murders and 90 percent of British murders. Most of the victims are male and poor, between fifteen and just shy of thirty. The homicide rate has shaved seven years off the life expectancy in the Rio favelas (slums). Brazilians might take some comfort from the fact that, as a whole, their country comes out pretty well in the Global Peace Index. In 2015, Brazil ranked 103 out of 162: not great, but better than Honduras, Guatemala, and El Salvador. It's also a far cry from Syria, Iraq, and Afghanistan, the worst performers on the list. Brazil isn’t that far off from the United States, ranked 94, either. After all, these relative rankings don't really convey the atmosphere of pervasive violence in the country, even during the Lula years, when the economy was expanding and the poorer population was getting more of a share of the pie. During Lula's first term, for instance, rural violence actually increased as disputes over land spiraled up 83 percent. Despite his commitment to greater income equality, Lula failed to address the enormous concentration of land in the hands of large farmers and landowners. He did try to reduce the deforestation that was eating away at the Amazon and other parts of the country, but that trend reversed after 2012. As in the United States, people of African descent face a much greater chance of dying in Brazil -- at the hands of police or in homicides -- than white people. This summer, a version of the Black Lives Matter movement, called React or Die, began to gather steam in Brazil. It was about time. For a country that was the last in the Americas to give up slavery, that imported 10 times more slaves from Africa than the United States did, and where Afro-Brazilians make up more than half the population, Brazil has long been in denial about its structural racism. It's a safe bet that where there's oil, there's corruption. Even in Norway, which generally gets reasonably high marks from Transparency International, the country's oil company Statoil has been embroiled in a corruption scandal around its dealings in Angola. Brazil's government-controlled energy company, Petrobras, is involved in a set of scandals of much greater magnitude and impact. The company, beginning in 2004, orchestrated a series of kickbacks in which contractors colluded in overcharging for services and then shared the proceeds in the form of, essentially, bribes. A handful of Petrobras employees enjoyed huge windfalls, as did a cadre of officials from the ruling Workers' Party. Petrobras' self-inflicted wound coincides with a significant drop in world oil prices. Since the company represents an astonishing 10 percent of Brazil's GDP, the fact that it lost half its value in the last year has had a disproportionate effect on the country's economy. Unlike many oil-exporting countries, Brazil isn’t dependent entirely on the market for crude. It has a rather diverse portfolio of goods that it sells to other countries, from soybeans to iron ore. But it did develop a dependence on one country to buy those goods: China. Between 2000 and 2013, Brazilian exports to China rose from $2 billion to $83 billion, and more than half of all exports began to flow to that country. A drop in commodity prices in the spring followed by Beijing's devaluation of the yuan -- which made Brazil's exports more expensive -- was a devastating one-two punch. Widespread violence, structural racism, endemic corruption, and a set of external economic shocks have all contributed to Brazil's fall from grace. Can the country recover from such a public embarrassment? The Bolsa Familia will likely continue, since it enjoys broad political support. It's not just a handout. Payments to mothers are contingent on children going to school, getting proper meals, and receiving adequate health care. It's an early-intervention program that works. But the larger legacy of Lula remains at risk: for instance, the nature of the state's involvement in the economy. Ideally, the state can play an important role in stimulating the economy, putting resources into such sectors as sustainable energy, and providing a measure of stability to counteract market volatility. But that assumes a “clean” state. The Bolsa Familia has been a critically important program, but what's the point of redistributing wealth to the poor while at the same time redistributing wealth to the wealthy through corrupt practices? Finally, the BRICS model, including a new BRICS bank, sounds like something new and different. But in reality, the BRICS basically just want to change the nameplates on the existing international financial system. This isn’t South-South cooperation as imagined in the New International Economic Order of the 1970s -- an envisioned restructuring of the global economy for the benefit of the South as a whole rather than just a few leading players. When push came to shove, Brazil under Lula engaged in the same ruthless scramble for resources in Africa that the United States, China, and other powers have engaged in for years. It's not too late, of course, for Brazil to make a major, mid-course correction. The Petrobras scandal is already prompting a major anti-corruption drive. China's economic slowdown is pushing the country to seek a more diverse set of trading partners. And in response to the omnipresent violence in society, various civic initiatives are addressing the nexus of police, gangs, and poverty. Still unknown is whether Brazil can pull this altogether as a credible development alternative, which can then perhaps influence the trajectory of the BRICS. Latin America: "What Happened to Brazil?"